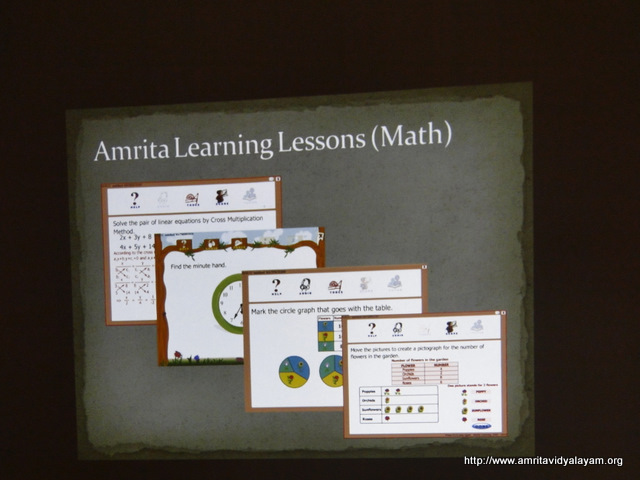 We commence computer education from lower classes itself. 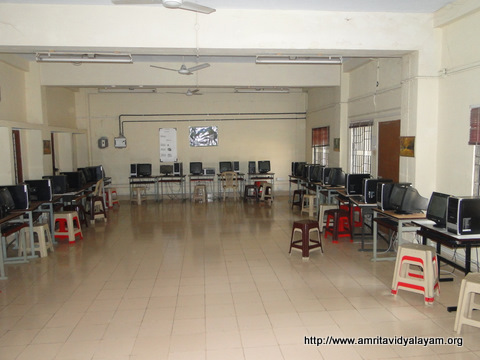 We make sure that high end machines are available for each child and our computer lab occupies two rooms. 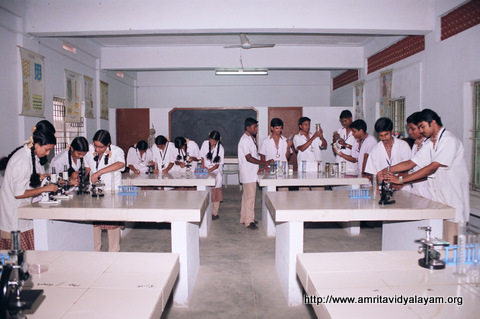 Our Amrita Vidyalayam has well equipped science labs, and we focus mainly on hands-on practical work, so that students may get a better insight into scientific theories. 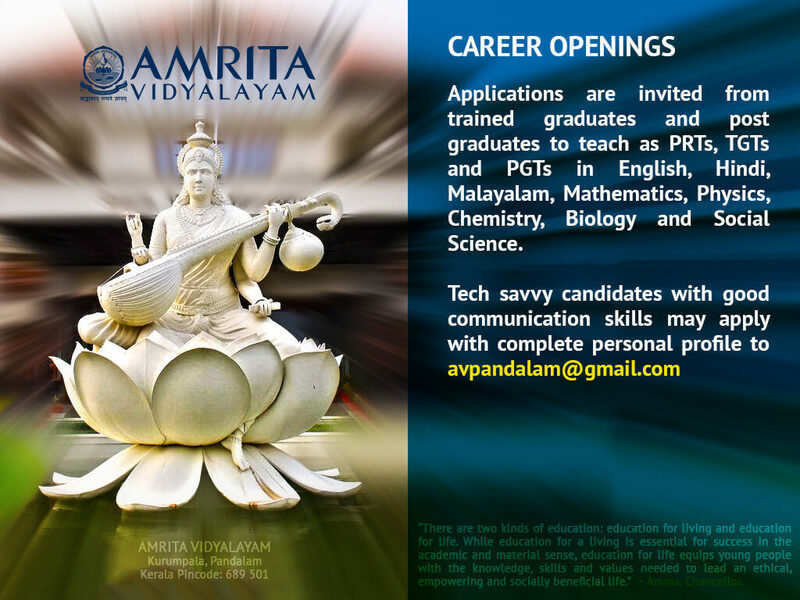 This enhances the inherent inquisitiveness of the student and energizes him to examine uncharted paths. We have three science labs, one each for Physics, Chemistry and Biology. 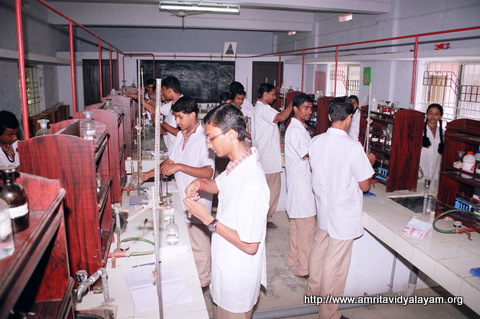 In these labs, we have the most modern scientific equipment and teaching aids, which reflect the high standard of education set by us. The school has taken great care to ensure that all sports requirements are met and our children are benefitted by the same. We have one room for sports related activities and have provision for indoor games such as carrom, table tennis and chess. 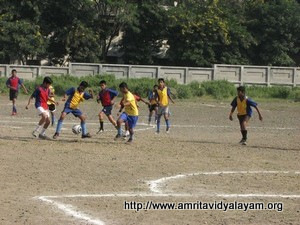 Ample facilities for outdoor games such as cricket, football, basket ball etc. are available, since we have the respective playgrounds. Our school has a well developed transportation facility that is available to both students and staff. We have a fleet of buses that connect the school to various selected locations across the town and its outskirts. The school building has one room each for the Principal, staff and office. 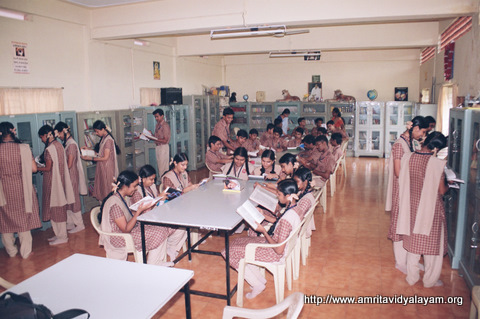 In all, there are 33 classrooms, 3 science labs, 1 math lab, 1 library, 1 computer lab occupying 2 rooms, 1 e-learning lab, 1 staff room, 1 examination room, 1 music room, 1 drawing room, 1 resting room and 1 sports room. The school has 24-hour uninterrupted water supply and power supply. The best, hygienic and separate sanitation facilities for girls and boys are available on all floors. First aid is available in the campus itself, and higher medical facilities are available nearby. 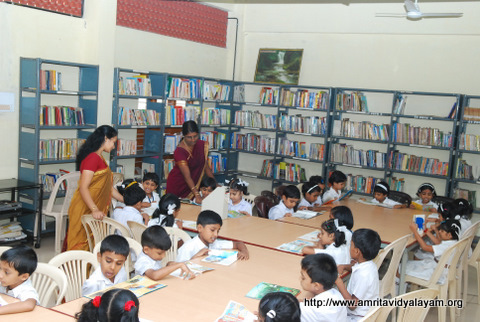 Counselling facilities are provided in the school for students who need it. We impart values to the children as part of the curriculum, and our educational environment enriches the students’ moral and social values. The nearest bus station is at Pandalam and the railway station is at Chengannur. The nearest airport is at Thiruvananthapuram.